Journalist, editor and women's rights activist Theodora Winton Youmans was the only Wisconsin native to ever rise to leadership in the state suffrage movement. As president of the Wisconsin Woman's Suffrage Association, Youmans's organizational skills led to the remarkable turnaround in public opinion that sent suffrage from defeat in 1912 to victory in 1919. Born in Ashippun, Wisconsin, in 1863, young Theodora Winton grew up in Prospect Hill, a crossroads between Waukesha and Milwaukee. Her mother, Emily Winton, a former schoolteacher, taught her to read and write while her father, Theodore Sumner Winton, a prosperous storekeeper and postmaster, tutored his namesake in politics. Although Winton attended Carroll Academy, the best school in Waukesha County, as a teenager, compared to other suffrage leaders of her generation, her education was limited. In the 1880s she became first a freelance writer and then a staff writer for the weekly Waukesha Freeman. She had her first byline in 1886 for a series in which she traveled the Northwoods alone and was writing the "Women's World" column by 1887. While fashion was a constant theme of her columns (reflecting the general trend in journalism geared toward women), Theodora Winton most often wrote about women's political progress. Reader response to her column convinced the Freeman to make it a regular feature and won her the only byline in the paper. In 1889 she married the Freeman's editor and publisher, Henry Mott Youmans. Mrs. Youmans became associate editor the following year. A leader in Waukesha's women's clubs, Youmans was elected district president and to the board of the Wisconsin Federation of Women's Clubs at its first convention in 1896. Two years later, in 1898, she became the federation's president. Her prominence in journalism and amongst club women led to more political appointments and to memberships on the state's semicentennial celebration committee in 1898, the Wisconsin board of managers for the St. Louis World's Fair in 1903, and the state board of regents of normal schools in 1905. In 1908 Youmans founded the Wisconsin Anti-Tuberculosis Association and worked to promote a national tuberculosis prevention campaign. Youmans began actively advocating for suffrage in the 1910s. 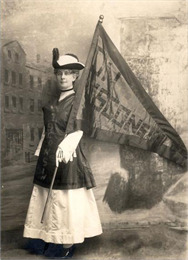 In 1911 sh became the "press correspondent" to the Political Equality League, a new suffrage organization established by Ada James to lobby for the 1912 suffrage referendum. Although the referendum failed, it was not for lack of publicity by Youmans: she began a "suffrage column" in the Freeman, sent weekly press releases to more than 600 newspapers, publicized the suffragists' fundraising drives, and won endorsements from Catholic and German Turners, two groups that had traditionally opposed suffrage. Perhaps her biggest victory came when she won the support of Wisconsin club women who had typically avoided the issue of woman suffrage altogether. After the referendum's defeat, the older Wisconsin Woman Suffrage Association merged with the larger Political Equality League and Youmans became president in 1913. Youmans traveled to New York in 1915 to assist with a state referendum in which she worked with national leader (and Wisconsin native) Carrie Chapman Catt. Catt believed that the best strategy would be to gain enough support for suffrage on the state level to force a federal amendment. Youmans agreed to the plan, but other Wisconsin suffragists pressed for another statewide referendum. It failed in 1917. U.S. entry into World War I challenged Youmans avowed pacifism, especially after Catt proposed that women could win President Wilson's support for suffrage by supporting his war. Putting suffrage before all else, Youmans went along with the plan, which sharply divided the Wisconsin Woman Suffrage Association leadership. Finally, in 1919, the suffrage amendment, with Wilson's support, passed Congress, and Wisconsin became the first state to ratify woman suffrage. In 1920 Catt founded the League of Women Voters and Youmans became the Wisconsin chapter's first president. Youmans ran for state Senate in 1922 as a Republican and lost. Youmans died in 1932 while serving her third term as president of the Waukesha Women's Club and as chair of the state federation's civics committee.